April | 2008 | Two cultures, one mind. (anyone born after 1990 will probably not get the Fast Show reference, shame!). Marking is continuing, with wildly disparate experiences across the group. HND assignments are nearly done, most people have done ‘OK’, but with a few cheating cases which I’ve passed onto the Investigating Officer. Meanwhile I’ve got 17 x 3,000 word assignments sitting on my desk, and another 7 x 10,000+ word dissertations. That’s a lot of reading and marking, and one of the reasons why I felt I couldn’t go to a Forensic Computing seminar this afternoon at the tic. Overwhelmed it an over-used term, but I feel very much like that at the moment. When I catch the train from my local station (meant in the loosest sense, it’s still four miles and can take me 25 mins to get there) into Birmingham, I pass the new Walsall College building. At the moment it looks less like a college, and more like a lego play set – precast concrete slots are being interlinked together. It makes me wonder however what the new university building at EastSide will look like – and if we’ll make the same mistakes that were made at Perry Barr, and even at this early stage I can see are happening at Walsall College. Firstly the Walsall college building has a huge number of windows. This makes it light and airy… and also means that for most of the time that you are teaching in the classrooms you have to have blinds or curtains drawn to get a decent image on the PC projector. This makes the general classroom light dark though – no wonder students fall asleep (though not in my sessions, honest!). The college also has a horseshoe shaped design. This makes sense on paper – maximum use of space and maximum light – see above. But This also means that there will be a ‘light’ side and a ‘dark side’ to the building – and keeping the heating matched between these two sides is difficult. Also think about directions and navigating your way around a building like this – you make one wrong turning when you get out the lift, and you have to backtrack all the way. In theory, Perry Barr overcomes this with a rectangular building, and you should be able to go from any of the four sides to the other side – alas for security reasons many of the internal doors are locked, making for a maze which it took me six months to master. The tic at Millennium Point, Birmingham has overcome both of these issues with style. Teaching rooms are ‘internal’, and have no windows to worry about, and staff/meeting rooms are on the ‘outside’ of the building, providing some good views over a regenerating Birmingham. I particularly like one room which I’ve had meetings in where you can see all of the trains approaching/leaving New Street station – it’s like having a huge, life-size train set. But the tic, and the whole of MP suffers from a floor and room numbering system which makes no sense to anyone. I have actually been with someone who had worked there for years, and got lost trying to find the meeting room. Once there, and I asked where the toilets were he looked at me in despair, clearly there was no way I would find my way back to the room afterwards. So, what is the ideal teaching building? Let’s see what I like about my current building. Firstly, it’s ‘zoned’ as well as it could be given the constraints. Third floor PC labs and learning resources, with the technicians there to help. Second floor for teaching rooms (and some staff roooms). First floor is mostly staff rooms, admin and storage, with just a couple of small teaching rooms (which I like using, as I can pop to/from my office very easily if I’ve forgotten anything). A teaching building should have a uniform structure, but have visual clues to ensure that you know you’re in the right place. This is done well at the Queen Elizabeth hospital in Birmingham which I’ve been to recently, three coloured zones, meaning I could find East 3A bay 6 without (almost) a step wrong. Well, my train is now pulling into New Street station – I’d better fine a wi-fi zone and upload this rather rambling post. 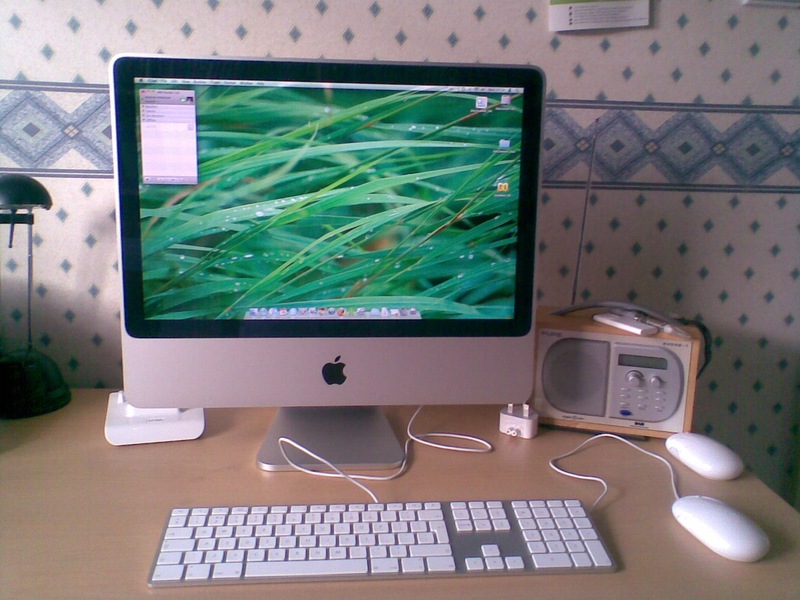 As could have been predicted, less than a month after my new desktop was ordered, the iMac has been updated. The key thing is a processor speed boost for the base model machine which I ordered – to 2.4 Ghz (mine is 2.0), linked to a faster bus. More info from the macrumors site. I’m not too upset – whilst it would have been nice to have had the latest processor, this machine (esp. with the 4Gb memory) does all that I need, and is (fairly) futureproof. There’s always a faster/better/cheaper/smaller product just around the corner. It can’t be helped. The form factor hasn’t changed however, the aluminium casing is really durable, and apart from missing a standby light, there’s nothing I would change with my model. On my usual tortuous journey into work this morning, I heard an article on Radio 4 about a new music service, we7. I remember a colleague mentioning this to me sometime last year. Apparently the Sony/BMG music catalogue is now available through this, and many of the tracks are available as free mp3’s, if you are prepared to listen to a short (they appear to be about 5 second) ad at the start. Mp3’s are, as you know, DRM-free, meaning that they can be shared across all devices, including iPods. Not all songs are available for free, and not all can be downloaded for a fee (99p, compared to Apple’s 79p for a single track), but I still think this service could be a winner for people like me, who have an eclectic taste in music. an awful instrumental version of Andrew Lloyd Webber’s I don’t know how to love him, which was Muzzak at it’s worst. the theme tune to ‘Animal Magic’ – great for novelty value but doubt that it’ll make my permanent collection. a Doris Day rendition of ‘Bewitched, Bothered and Bewildered’ – clear, concise and enjoyable, this will live in my library permanently even with the five second ad for we7 at the start of it. Let’s see how this business model lasts long-term, but in the meantime I thnk I’ll have a little ‘splurge’ on some ad-supported music for long car journeys – but will tag them in iTunes so that I can easily delete them if I do find the adverts too irritating. This is a quick note to let me take a breather whilst doing my OU marking. It’s going well, started slowly but I’m now picking up the pace. I’m delighted (considering the £750 investment) that the mac is working exactly how I had hoped it would. Running Parallels in coherence mode means that the OU eTMA file handler and Open Office, both running under Windows XP just hover on my screen in the same way as any other native OS X application. I keep all the TMA’s in the Windows environment, so there’s no need to worry about sharing files between the Windows VM and Big Mac (cut and paste works great luckily between machines). The TMA question itself sits nicely in preview, whilst the marking scheme and model answer are open in NeoOffice for reference. I’m also storing the marks in a NeoOffice calc spreadsheet to easily transfer the information (and so that I don’t have to worry about adding the marks up myself). iTunes (listening to Hitchhikers Guide to the Galaxy), Adium (so that I can twitter my friends on my progress, and receive tweets in response) and Firefox for the odd web surf/distraction means completes the setup. I did, as usual, print off the associated paperwork, but I’ve not referred to it at all, the widescreen on the iMac means I can easily have two documents up side by side without having to squint. Better continue marking, I’m determined to get another one completed before Doctor Who! My colleague John Colby started at (what was then) University of Central England three weeks before me (it would have been the same start date, but I decided to spend some ‘me’ time between jobs – I would recommend this though it also made me as poor as a church mouse for a couple of months. He has now started his own blog – http://johncolby.wordpress.com/ and I would encourage you to spread the word. Though supposedly a maths blog, it has already wandered into other areas, including the roaming rights of dogs! Yesterday was the culmination of two months planning, as the vast majority of the ITMB students within the UK attended the ITMB all student event at UCL London. It meant an early (very early) start for us, the coach was supposed to leave university at 6:30am, meaning a 5.00 wake up call for me. We hit a few snags amongst the way, but still made good(ish) time given London traffic, and were nibbling our Danish pastries by 10:15. The day was a mix of lectures by industry leaders, workshops and student competitions. We’ve never done too well at these in the past, but the students this time had worked really hard. Whilst we did not finish in the top three places for the First year poster competition, the second year students came second in the debating competition, beating Northumbria, Oxford Brookes, Greenwich and UWE, narrowly being pipped at the post by Manchester University. Each of the four students won £150 defending the position that “Alan Turing was the person, who throughout history, has made the most significant contribution to the progression of IT”. Out of interest, the winner was Vint Cerf, the ‘Father of the Internet’. Of course, the irony that Turing did much of his post-war work at Manchester University, who beat us in the competition, wasn’t lost on some of us. Then it was onward to a meal in Covent Garden, and apart from a couple of missing students, a missing bag, and (briefly) a missing lecturer, it all went to plan and timings. I was back home by midnight, and though shattered I couldn’t drop off to sleep, and was awake at 3am to hear the first questioning chirps of the dawn chorus. All in, it was a good day, and everyone seems to have enjoyed it. We’re hoping to get some good promotional material out of the competition win, and a promotional video for e-skills shown at the event was also really well put together. I’m working from home today, not recovering, but catching up on emails and paperwork from a manic teaching day on Monday, and being out all day yesterday. It’s going to be hard for me to blog over the next couple of days, so I will try an experiment and up my Twitter tweets in that time. I’ll write up the event here on Wednesday, hopefully prompted by the Tweets. (Last iMac posting for a while, I’m aware that I can become a bit of a bore). Well ‘Big Mac’ is now fully productive, the time for fiddling and tweaking is over… at least for a while. I was thinking that maybe the one gigabyte of memory would be sufficient for my needs – after all this was double what I had in my old PC. For most of what I am doing I am sure it would be absolutely fine, and it was only this afternoon that I started to think that my machine was running slow. OK, I was ripping a DVD using Handbrake, had several browser windows open, was chatting on iChat, and also testing video through Parallels and running MSN Messenger through Parallels (plus a few other windows open!). I wasn’t trying to break Big Mac, honest, but it did start to creak a little. So I’ve gone and ordered the 4 gigabyte memory upgrade from crucial. I was almost swayed just to have another two gigabyte module, but at least this way it should meet my needs for a while. After a surprisingly short space of time, I’m up to (nearly) full productivity on my new iMac. All the applications have been downloaded or installed, apart from Microsoft Office, more of which later. I’ve been able to transfer my iTunes library and iPhoto from my laptop to my main machine, and all the various media plug-ins and players are also working. One thing I’ve been amazed and delighted with is the sound quality of the speakers… and of course where the speakers are. They in fact bounce sound off the desk, but they are loud, and listening to some music which I thought I knew well, there’s a depth to the music which I’ve not experienced before. But a word about the various ‘Office’ options that are available to me, and which I’ve considered. I am entitled to install Microsoft Office for Mac – I have a license agreement etc. But whilst the software does the job, and would offer the most compatibility with the files which I need for work, it is very large and is clearly ‘Microsoft’ in look and feel. So I thought I would consider some of the alternatives which are available to me. First was of course OpenOffice. I downloaded this, and installed with no problems. I am using OpenOffice for my Open University work within Parallels, and have found it easy to use and works well for what I need there. However, under native OS X operation, it first has to install X11, and runs under that. This takes around thirty seconds to boot up with my measly (for the time being) 1 Gig memory, though fast enough once loaded. I’ve still kept the .dmg file, and when I’ve upgraded my memory it may offer acceptable performance, but for the time being native and ‘true’ OpenOffice doesn’t meet my needs. So I’m looking again at NeoOffice. This is a ‘true’ port of OpenOffice into the Mac environment, with a mac look-and-feel. I did look at this when I was having problems installing Microsoft Office onto my MacBook, but discounted it once I did get Office working OK. It’s downloading as I speak (another huge download, I’m so glad I’ve got a 40 Gb usage limit with TalkTalk, I think I may be coming close to that this month). But enough playing, I need to start using the machine to be productive. I’ve made a good start with my Open University work, sending some information onto a colleague which was asked for following the event in Milton Keynes last weekend. I think another late night may just be beckoning.